The Professional Regulation Commission and the Professional Regulatory Board of Medicine inform the public that the Physicians Licensure Examination (PLE) scheduled on September 15-16, 2018, to be held in Manila, Baguio, Cebu and Davao is POSTPONED due to the impending onslaught of typhoon “Ompong”. The postponement is in consideration of the latest forecast of PAGASA-DOST on typhoon Ompong and its expected impact especially to Baguio where Tropical Cyclone Warning Signal No. 3 was raised, including expected extensive flooding in Manila. PLE shall be rescheduled to a date that will be announced soon. Below are the re-scheduled dates of PLE for September 2018. We advise to keep tuning in here and at PRC official website for further reminder(s) from the Board of Medicine. The Professional Regulation Commission and the Professional Regulatory Board of Medicine announces the new schedule for the postponed September 15-16, 2018 Physicians Licensure Examination (PLE) due to Typhoon “Ompong”. 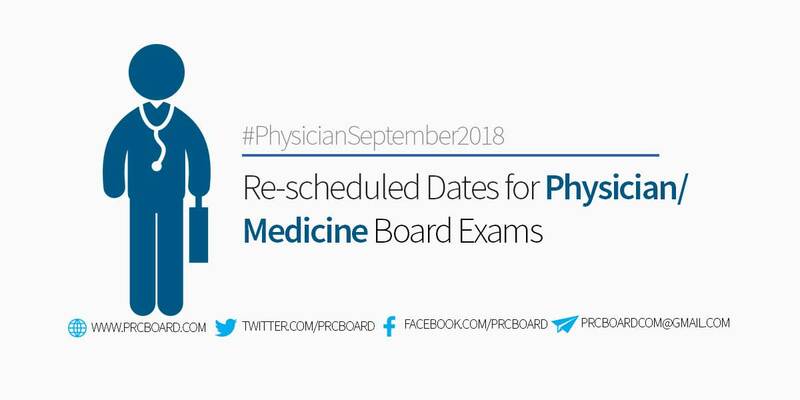 To keep updated on the official results of September 2018 Physician, Medicine board exam as well as other related announcements, we advise our visitors to bookmark this page, visit PRC official website, follow us at our social media pages via Facebook and Twitter or join the members discussions at our Facebook Group.